Its examination season and everybody is studying hard and doing everything which takes to get highest marks in FSC annual exams and thus students are now searching for the past years intermediate papers. 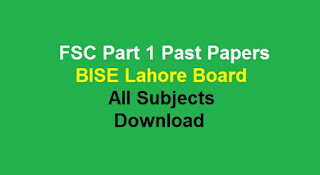 Here we are going to share with you the links to the FSC part 1 past papers by subject for Bise Lahore Board so you can download Lahore Board FSC part 1 past papers for more than 5 years and prepare for the exams. All you have to do is just select you subject to get your require pastpapers of 11th class (FSC Course) of Lahore board for many years and we have uploaded first time and second time papers separately so you don't have to worry about that. We have organized the past papers so you can download them easily and start studying right now. If you are not able to download the FSC part 1 past papers for bise lahore board from this page for all subjects than comment below and we will give you the solution right now.